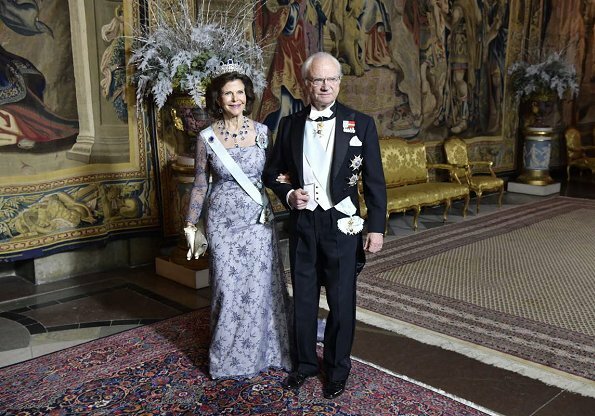 On December 11, Monday, King Gustaf hosted a traditional dinner at Stockholm Royal Palace, held for 2017 Nobel Laureates. 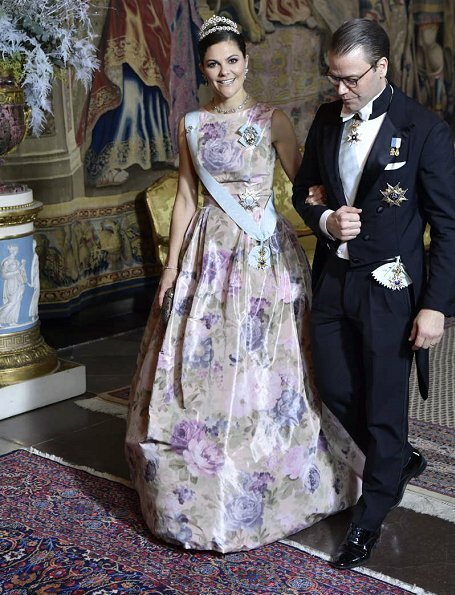 The guests were welcomed by Swedish Royal family members, that is, King Gustaf, Queen Silvia, Crown Princess Victoria, Prince Daniel, Prince Carl Philip, Princess Sofia, Princess Madeleine and Christopher O'Neill at Vita Havet Assembly Rooms. The dinner was held at Karl XI's Gallery. Wow,again ladies look perfect ! Das Kleid hatte Madeleine auch schon auf Hochzeit von Prinz Carl Philipp an, damals war sie mit ihrem Sohn Nicolas schwanger, der 2 Tage nach der Hochzeit zur Welt kam. Sofia's gown is for me this time the best looking. I also like her hair and posture, it's even a bit elegant. I agree with you, Masha. It is great, the way she fits in, it can not be that easy to get used to that kind of life. Me too! Sofia looks like a fairy in this dress, adorable! And Silvia looks very good too. I also like Victorias dress, but the skirt seems to bulky. The colour of Madeleines dress is boring. The Princess of style and elegance the one and only Princes Madeleine. Stunning, warm couple. Most agree. 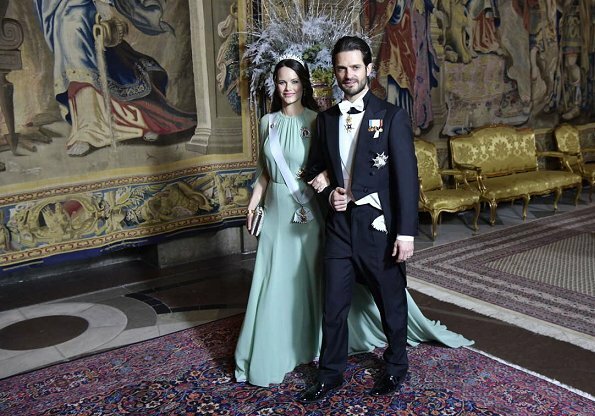 Victoria is also in a great outfit but Madeleine beats everyone. LOVE this gown. Adoro o visual da rainha e respectivas princesas :)) Pessoalmente não fiquei fã do penteado da princesa Sofia. Com aquele vestido lindíssimo acho que o cabelo apanhado ficaria bem melhor. Love Victoria's gown. It is so romantic and perfect for the setting. Is it alsi possible to put pictures of the designers off the two other princess ??? Victoria's dress looks too long and the fabric is horrible, the top fits very nicely though. Sofia's dress looks like it's slightly too big on her, the waistline droops. The winner tonight for me is Madeleine, beautiful dress, hair and jewellery. Very happy she reused this gorgeous gown. The queens dress is pretty too and she has fabulous hair that really can carry off a tiara like this. Yesterday was a better night all around in my opinion. Victoria's dress is so much better than yesterday, even if there is a bit too much fabric in the skirt. This flatters her face so much more. Madeleine's dress is nice, especially the colour which really suits her. Sofia's hair is awkward with the tiara and I dislike that seafoam colour. The queen looks elegant and I think it's a great choice that she has stepped away from bouffant ball dresses. Yes I think the dress of Sofia washes her out. Maybe it would work in the summer, but not with Nordic winter pale skin. All Swedish royal ladies look very beautiful and elegant. Each of them have their own style of dress. Sofia...she looks so beautiful. Love this new pale green dress, even though I wish she had added a belt or something to her waist (waistline seems a little empty/unfinished. Her hair were down and looked gorgeous from the side/back. Madeleine...so glad she wore this gown again. This color suits her complexion so well. Add that modern fringe tiara and beautiful elegant hairstyle...she looks glowing. Victoria...in a big ball gown. I really adore big ball gowns but for the day 2 event it looked too much, especially when others wore simplier gowns. It would have been great for 10 December. I also didn't quite like the way it bunched around her feet, like it was too long or something, nor its shiny material. Glad to see Lilian's tiara make appearance again. 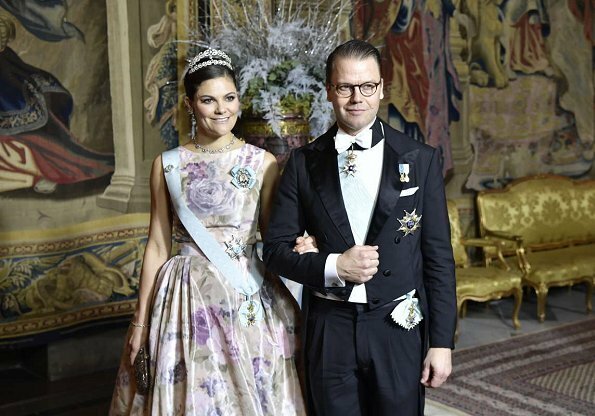 Queen Silvia...with the sapphires...woww, and dress to match them. So lovely. 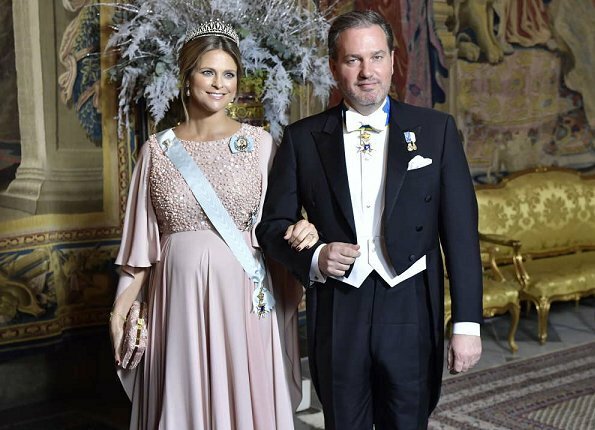 Princess Madeleine looks stunning. I absolutely love her hair. That’s how you wear a tiara. I loved her dress's petal-soft color and those cape-style sleeves and a short train added etherealness. This dress looked even more exquisite when she moved. Princess Victoria's hair look slightly better with this side parting but again so tightly slicked down hairstyle. Its not very feminine! Also her big ball gown looked out of place among other royal ladies, its like she wanted to show off but instead her skirt looked like a shiny haystack. Sorry, another miss. 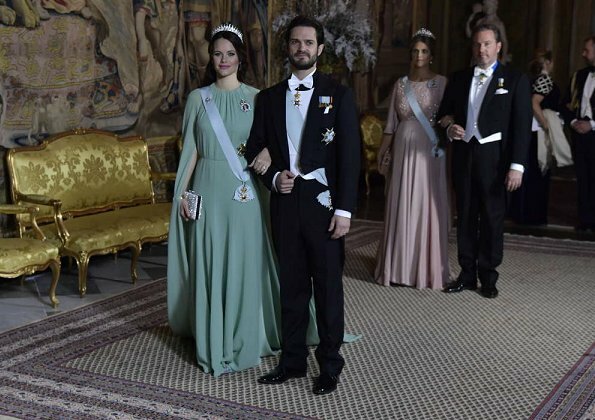 Princess Sofia looked so lovely in pastel green. Loved its cape-style sleeves. So simple and elegant. One of her best evening gowns (only downside was the waistline - it required a belt or ribbon to cover middle seams. Perhaps next time?). 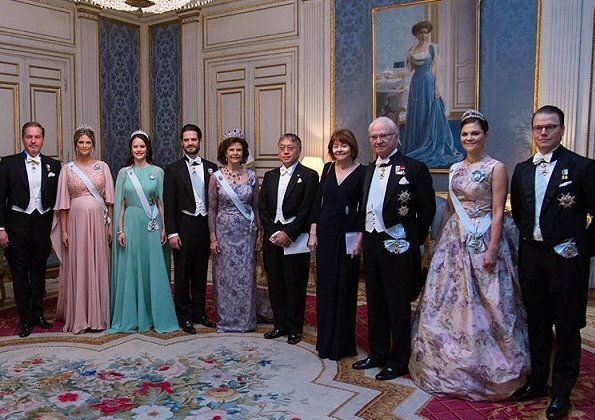 Queen Silvia and the sapphires, wonderful combination. Loved her recycled dress. 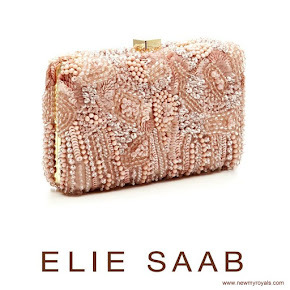 It's never a risk to wear Elie Saab and the color suits Madeleine very well. On the other hand the Sofias dress: wrong color for her skin and too shapeless. Victoria just prefers sweeping silhouettes, not my favorite at all, but nice pattern. The queen looks fantastic for her age, especially on the previous evening. Alle Ladies sind sehr schön, mir gefält auch Victorias Kleid, obwohl es etwas zu oppulent und zu lang ist. 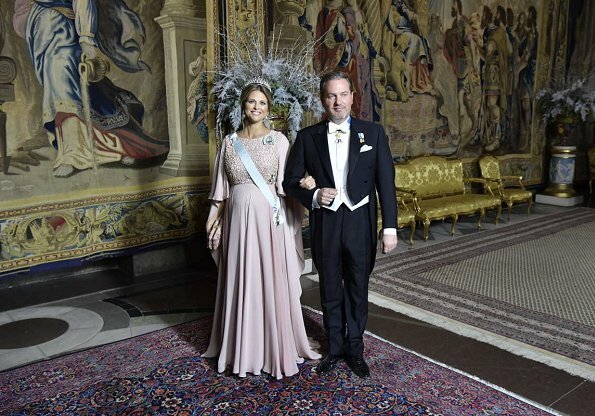 Die schönste für mich ist Madeleine, das bekannte Kleid hat sehr schöne Farbe und sie sieht darin wunderschön aus, ihre Frisur, einfach alles - für mich die schönste Prinzessin Schwedens. I have to recognize that Victoria's dress is really becoming for her although I don't like the shiny flower fabric. Much better than the ceremony dress. 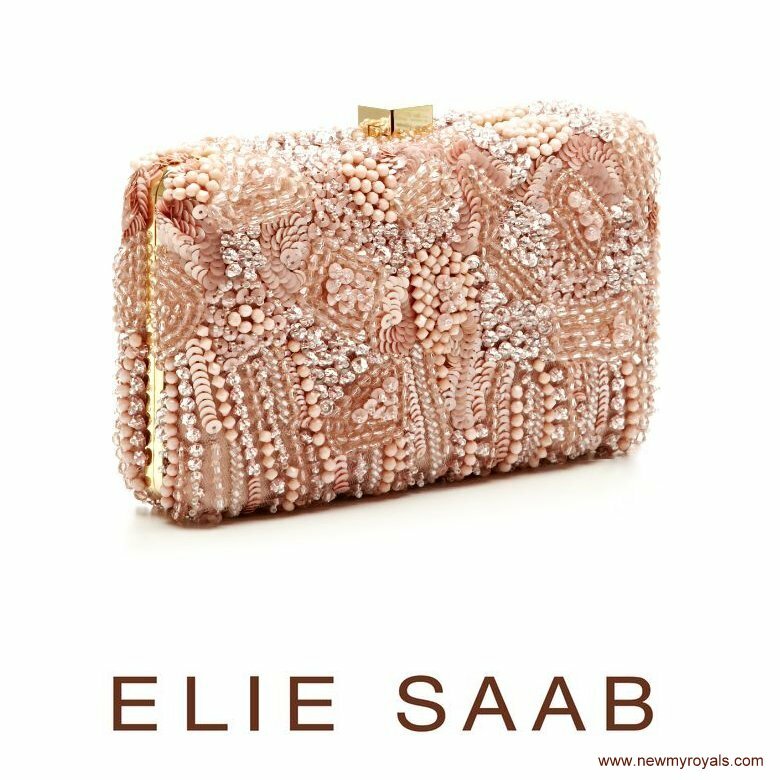 Madeleine, fantastic as usual ley. Sophia needs a belt to finished the outfit. Pale green and vaporous fabric look strange in winter. Better for a summer dress with tanned skin. I love Victoria's dress here as well as Sofia's although I think her hair would be better styled up. The Queen looks good and I don't Madeleine's look is anything special - she looks fine but then I'm not a huge fan of her style. Wow! Victoria has gone full on "Princess"!